The spine is composed of the cervical (neck), thoracic (upper back), and lumbar (lower back) regions. Each region has uniquely shaped bones known as vertebrae. When the twenty-four vertebrae perfectly align, they form a structure known as the spinal canal. The spinal canal has the important jobs of protecting the spinal cord and allowing it to branch out to innervate the muscles and organs of the body. Physical therapy. Muscle imbalances can cause the spine to favor certain positions and movements. When left uncorrected and when coupled with arthritis, muscle imbalances can change the shape of the spine and cause Spinal Stenosis. Physical therapy is an effective treatment option that relieves the symptoms by stretching and strengthening the muscles, tendons, and ligaments that support the spine. Non-steroidal anti-inflammatory drugs (NSAIDs). When the spinal cord or nerve roots are compressed due to Spinal Stenosis, they become irritated and inflamed. This causes symptoms that range from mild to severe. In order to treat inflammation and alleviate symptoms, over-the-counter (OTC) and prescription medications known as NSAIDs may be taken orally. Common NSAIDs include aspirin, ibuprofen (Advil and Motrin), naproxen (Aleve, Anaprox, and Naprosyn), and celecoxib (Celebrex). Corticosteroid injections. Fast acting symptom relief can occur when powerful anti-inflammatory medications known as corticosteroids are injected into an area of the spine that is affected by Spinal Stenosis. Injections are typically used in conjunction with physical therapy to ensure long lasting symptom relief. 4. A Minimally Invasive Laminectomy. 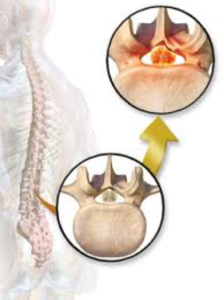 Arthritic bone and soft tissue that is causing Spinal Stenosis are surgically removed. The spinal cord or nerves are decompressed and symptoms are eliminated. 5. A Minimally Invasive Spinal Fusion. If there is instability of the spine in addition to Stenosis, a fusion may be indicated. Arthritic bone and soft tissue are removed and replaced with an implant filled with bone graft. Over time, bone graft and existing bone fuse to form a single, solid bone to eliminate the instability. If you’re experiencing the symptoms of Spinal Stenosis, please don’t hesitate to contact our offices to arrange an appointment with one of our Orthopedic Spine Specialists. We have locations in Glen Rock and Maywood, NJ.